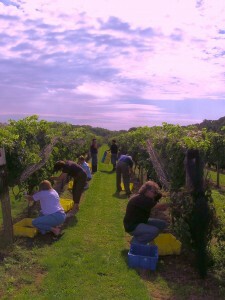 October is harvest time for grapes as well as apples and pumpkins here on the North Fork of Long Island. This year I decided to take part in the custom wine making program run by Lisa and Anthony Sannino at their Bella Vita vineyard in Cutchogue. I want Shorecrest to have its own wine and a couple of other BnB owner friends, Mark and Liz Macnish of Andrew’s Legacy in Cutchogue and Leueen who owns Harbor Knoll in Greenport liked the idea too, so we purchased a barrel together. This is such a great idea! A barrel produces 23 cases, 12 bottles to a case, and is such a fun thing to do with friends or family. Merlot grapes on the vine ready for picking. The program is a hands on experience, from harvesting the grapes in the Sannino’s own vineyard and learning all about viticulture as we go, through all the processes involved in creating a bottle of wine: picking, crushing and pressing the grapes, through the fermentation process and then blending and bottling. Two weeks ago, at the end of September and right before a storm was due to come through I went out with some other ‘winemakers in training’ to pick Merlot grapes. The harvest is early this year on the East End of Long Island due to the long hot summer, starting with some 75 degree days in April and ninety degree days in June. Grapes do well in this weather and the sugar content is high. That is how Anthony knows when the grapes are ready to harvest; he measures the sugar content and crushes a few bunches to taste the juice. So delicious, and that is before it became wine! Also delicious was the al fresco lunch that Lisa, with the help of Anthony’s mom and dad, served on their farm house’s porch in the vineyard, but I get ahead of myself. 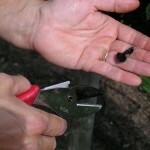 The seed of an unripe grape is green, and reddish in a ripe grape. The morning for our grape picking experience was perfect; not too hot or chilly, and started with coffee and breakfast on the wrap around deck. I’d already served breakfast to my guests but was glad of an extra ‘cuppa Joe’ before we went off into the vineyard with our pruners and collection baskets to pick the ripe bunches of grapes. I learned where to cut and which ones not to choose. 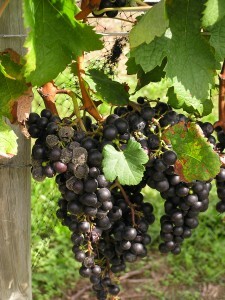 The seed of a ripe grape is reddish and green if it is not yet ripe. There are also several diseases that can afflict grapes especially fungi and these were to be avoided. The fungus that we saw a little of that day was BotrytisAs an avid gardener, I had yet to meet a fungal disease that I could like, but Botrytis I learned is not all bad. 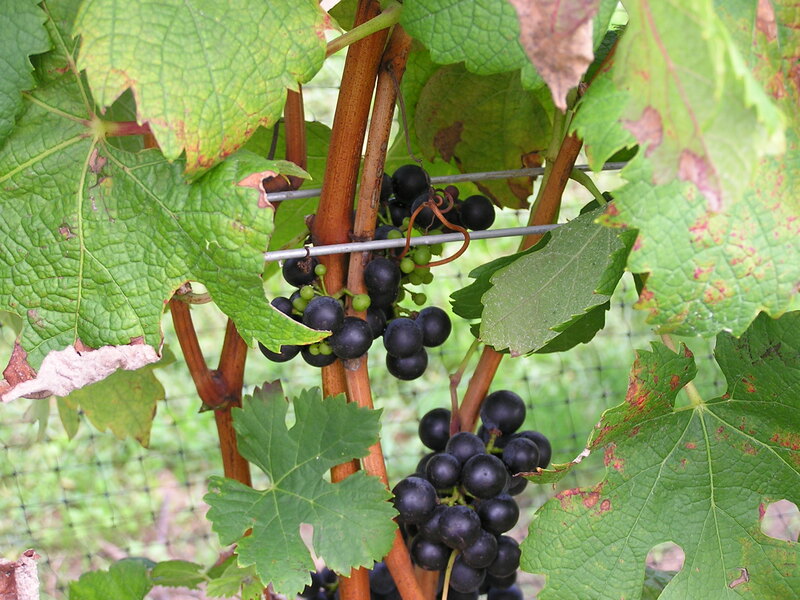 The fungus gives rise to two different kinds of infections on grapes. The first, grey rot, is the result of consistently wet or humid conditions, and typically results in the loss of the affected bunches. The second, noble rot, occurs when drier conditions follow wetter, and can result in distinctive sweet dessert wines, such as Sauternes. 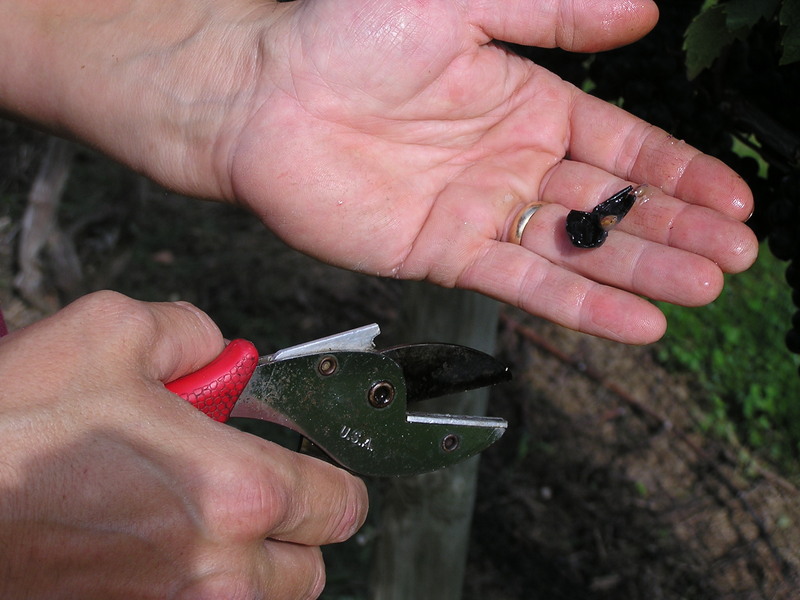 This summer, with such consistently hot weather the few bunches that were infected were of the ‘noble’ kind but as we were picking merlot and not grapes for sweet wines, we had to discard those. What not to pick - Botrytis blight at 3 o'clock! 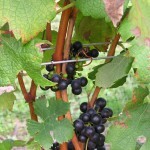 We were also careful to avoid the under ripe grapes that were higher on the vine and shaded by more leaves. 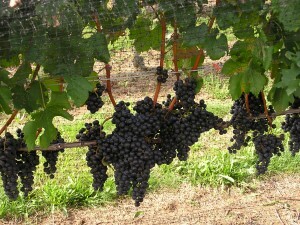 The grapes we wanted all grow at the lowest level of the vine and were hanging down in giant lush clumps. We picked for several hours and when our bins were full and also the stomachs of us field hands (after eating as much fresh baked pizza, pulled pork, salad, chicken and pasta as we could, paired of course with equally delicious Bella Vita wine) we headed off to help with the ‘crush’. The baskets of grapes were loaded onto trucks for transportation to the winery where they were weighed, Anthony taking careful notes all along, and then processed through a machine that de-stems them before shooting the crushed up pulp and skins into giant bins ready to begin the first part of the fermentation process. 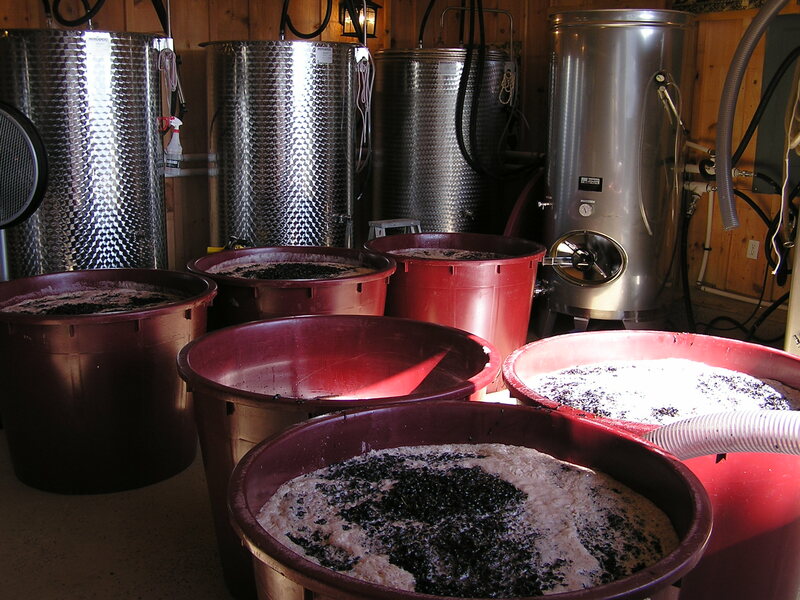 More on this in the next article, but if this interests you enough to think you would like to make your own wine and enjoy a wonderful North Fork experience in the process, contact me at the Shorecrest for a special discount on a barrel of wine when you are my guest . 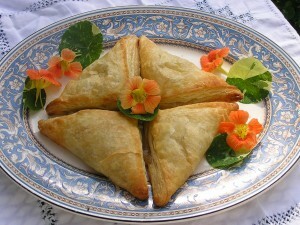 I will also be putting together special packages over the winter and spring that will include Friday night dinners with your weekend stay at the BnB, wine appreciation classes with food pairing, and guided tours with a customized itinerary based on what there is going on at the time, for my guests. 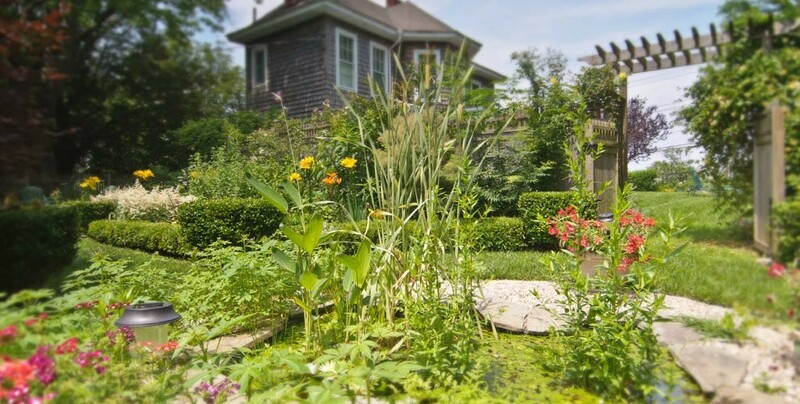 Larger groups might consider renting one of my private water front houses that sleep from 6-8 people and also accept children and in some cases pets. To see more details please visit the Shorecrest Property Management website. My website now includes a page with maps of all the wineries, restaurants and other amenities in the area. 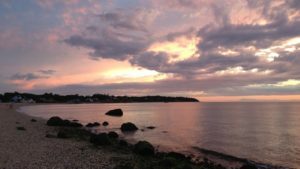 Check my ‘Area Attractions’ page before planning your trip to see all there is to do in this unique part of Long Island. 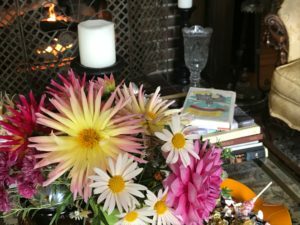 So keep checking into the blog for updates on how the wine making process is going as well as other events and happenings at the Shorecrest BnB on the North Fork of Long Island’s fabulous East End!